Today we visited the ancient Agora of Athens. While the Acropolis functioned as the primary location for all religious activities in ancient Greece, the ancient Athenians would enter the Agora for any number of reasons-ranging from the desire to work out in the enormous gymnasium, purchase goods at any one of the local shops, or sit in the shade and listen to philosophers like Socrates, Plato, and even St. Paul wax intellectual. 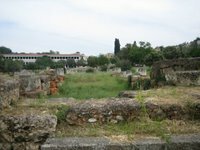 Sadly not much remains of the Agora, save for the Temple of Hephaestos and The Stoa of Attalos. Most of the ruins are just that: ruins. You pretty much have to rely on the graphical representations on the signs to imagine what the buildings looked like, because lines of stones of various heights are all that remain. 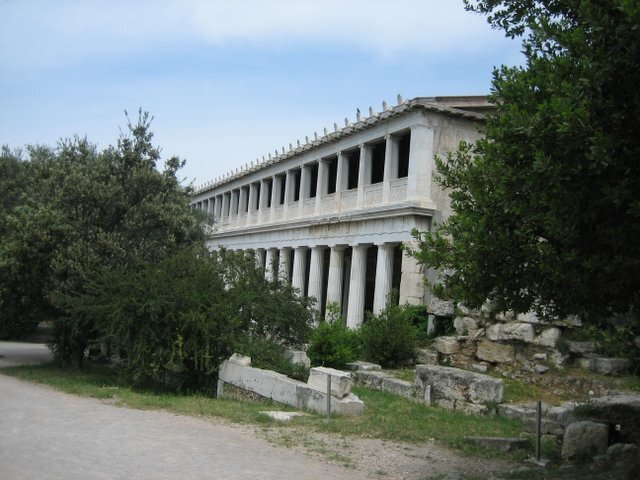 The Temple of Hephaestos and The Stoa of Attalos are the only real exceptions. 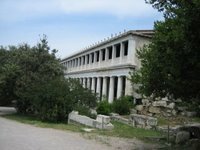 In all honesty, The Temple of Hephaestos is the only exception, as the Stoa was reconstructed and rebuilt in the mid 20th century. And who paid for such an enormous undertaking you might ask? A Rockerfeller. I find it a bit sad that it took the pocketbook of an eccentric American billionaire to get the ball rolling, archeologically speaking. While we walked through the museum in the Stoa I noticed that on just about every description card of every exhibit it stated that Americans funded the dig where the object was found. And the Greeks wonder why the English won’t give them back their artifacts. 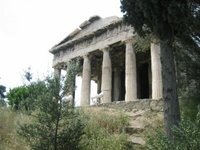 Unlike the Stoa, which practically looks brand-new, the Temple of Hephaestos looks ancient and surprisingly beautiful. It’s in much better shape than the Parthenon, and they let you walk right up to it. I learned from the description on the sign that up until the 1930’s the Temple functioned as a museum. That means that it still possessed walls, doors, and everything else that goes along with a functional building. I find it very sad that in a mere seventy-five years the Temple has fallen to its current state of disrepair, no matter well it compares to other structures in Athens. At the current level of maintenance in another seventy-five years it’ll be nothing but another heap of rubble with a sign showing you what it used to look like. We just happened to be walking around the Agora as the groundskeepers were cutting the grass, and half the Agora remained under the shade of a thick layer of foliage. It occurred to me that only through constant maintenance by man do those ruins remain visible. 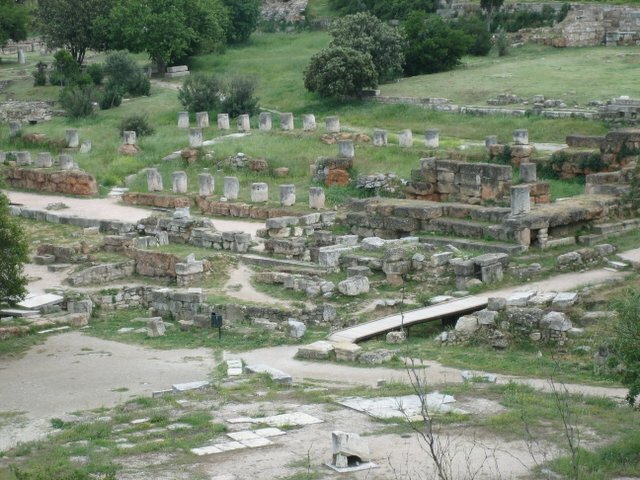 If we left it up to Mother Nature the Agora would have disappeared hundreds of years ago. Nature would have just swallowed it up like an afternoon snack and carried on like nothing happened, and humankind would be none the wiser. I just wonder how many other sites of archeological and historical significance lie just under the surface of the ground, waiting for someone to happen upon them. How long will it take for our civilization to disappear underneath the vines and grass? I betcha the Wal-Marts won’t last near as long as the Temple of Hephaestos or the Parthenon. Will any of our buildings even survive long enough for future generations to catalog and study? I have my doubts. We had dinner this evening at a restaurant from a recommendation made by our guidebook, and this time it totally redeemed itself. 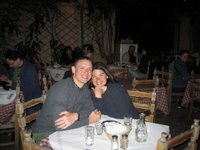 We ate local olives as our appetizer. I ordered lamb and Leigh ordered pork chops and we were both very pleased with our meals. The wine was so-so. I’m beginning to think we became a little spoiled from all that Italian wine. While we enjoyed our dinner a man played on his guitar-like instrument which created a very romantic ambiance. 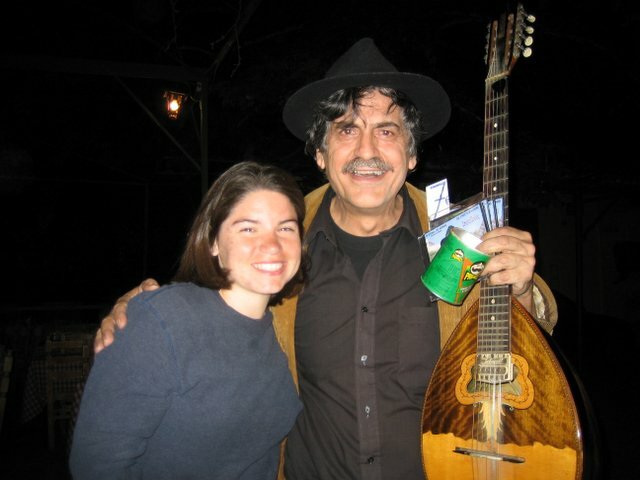 He had his instrument case set out to collect donations, and he also had a stack of CDs set up in the case for listeners to purchase. We had planned to simply throw a couple of Euro into his case as we left, right up until we heard him break into “Stairway to Heaven.” After that we just had to buy one of his CDs, even if “Stairway” didn’t appear on them. Anyone that cool deserves our patronage. We ended the night with baklava and panna cotta for dessert. Mmmmmm. 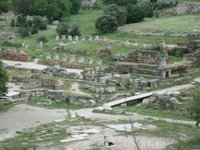 Tomorrow we leave for Delphi, the so-called “navel of the world.” I’m anxious to see the Temple of Apollo. Hopefully the muses will reveal to me fantastic secrets of our mortal world. Or at the very they’ll have some colorful souvenir books to buy. Either way really.